I’m betting that by this time, if you are following the suggestions in the previous three newsletters, you have identified some habits you need to change. Habits can sometimes be hard to break. You may need to appeal to your left brain – the logical side, to convince yourself you need to change the habit. 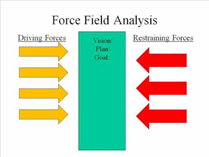 An easy tool to help convince your self is a Force Field Analysis. You can create one by drawing a large “T” on a piece of paper. At the top, or down the center, identify the goal/vision/plan. On the left side, label it “Driving Forces”. On the right side, label it “Restraining Forces”. Think about the habit and why it is important to change – as you brainstorm those reasons; note them on the left side. Now, think about the challenges you are facing and note them on the right side. Essentially, you’ll find this very similar to a list of “pros” and “cons”. Once you’ve populated the Force Field Analysis, think of ways to enhance the drivers – how can you make them even stronger? Are there ways to visualize the desired results? Draw a picture; place it in a prominent place where you’ll see it all the time. You’ll be amazed at how your subconscious will help you achieve that goal. Now consider the restraining forces. How can you diminish them? Is there a way to eliminate them? Can you enlist the help of friends, family, or others to reassure you that you can overcome those resisting forces? Perhaps establish an accountability partner – someone who won’t “let you off the hook” if you’re not making progress – someone that will remind you to stay the path! Now that you’ve identified a logical way to address the habits you want to change, here are some tips on how to make your new habits “stick”! Create a motivational reward and keep it in mind. Remind yourself regularly of the benefit you’re expecting. Use pictures and stories to capture progress. If it’s a long term goal, break it down – for example, organizing and purging all the extra “stuff” from the whole house will take some time. Reward yourself for each closet, drawer, or room you complete. Baby steps all add up to achieve bigger goals. For example, organizing the kitchen and placing items where they are used the most, will shorten the time to make meals or pack lunches. Link goals together. For example, if your goal is to reduce movement (one of the seven deadly wastes), consider where to put things when you are organizing (eliminating excess inventory of “stuff”- another waste) so that movement is minimized. Make a public commitment. Tell others what you are working on. Create a picture of what you want your office to look like at the end of each day and post it on your wall or cubicle. Give it 90 days or three months (whatever sounds best to you). Actions only become habits when done regularly and consistently for as long as it takes to integrate the change into your life. When it becomes second nature, you’ve achieved your target! Plan to take action. Often progress is minimized when we just talk about doing it. Put an “appointment” on your calendar to take action. Allocate some time – perhaps a half or full hour a day to making progress on your goals. Stack the deck in your favor. For example, if you need supplies to accomplish your goals, make that the first thing you get and, put them where they’re in your way. That way you’re much more likely to use them and take action. Regularly compare and contrast where you started and where you are. This is easy to do with pictures, stories, checklists, etc. Logging success creates endorphins in your brain – the feel good chemical. Endorphins create a feeling of bliss which in turn makes you desire to do more of the activity that is causing the release of the endorphins. We started our journey by setting a goal or goals. Review the goal(s) regularly and revise them to enhance your new “life style”. Build on the success you are experiencing! Put yourself first. Make it a priority to focus on #1 – You! If you aren’t taking care of yourself, who will? Setting and achieving goals, especially if they’re related to your health, help not only you, they help everyone around you. You’ll be happier, healthier, stress free and enjoy life! Till next time, keep up the good work! Be sure you are rewarding yourself for progress!